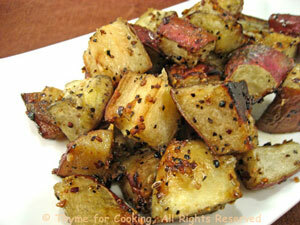 Grilled or Roasted Sweet Potatoes, with a bit of heat, Thyme for Cooking. These get a bit crusty on the outside and incredibly soft and creamy on the inside. These had white interiors, but were most definitely sweet potatoes. The heat went well with the sweet. They work equally well in the oven or on the barbecue. Put remaining ingredients into large bowl and mix well. Add potatoes and toss, coating thoroughly. Oven: Arrange potatoes on baking sheet with rim (I use my trusty, round pizza pan). Barbecue Grill: Put them into an old metal pie plate or cake tin or foil barbecue container. Cook on barbecue (grill) for 30 minutes or until done... and you will need to stir them with a long-handled wooden spoon occasionally as they tend to develop 'hot spots' and can get a little crispy.